Make sure to subscribe to the podcast on your podcast player of choice, but most of all, please, please, please head over to iTunes and leave a review. It helps the show rank and helps expose the show and these great artists to a larger audience. Click >>> HERE <<< to head to iTunes! You can also Click to Tweet the show! 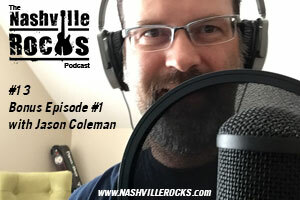 Sign up for Nashville Rocks Music News for updates on the podcast, artist interviews, images, merchandise and much more! Join the conversation on the Nashville Rocks Facebook Page! I’m just getting the ball rolling on the Pinterest page! Yes, I have Youtube running and will soon be publishing the podcasts there as well. Join me on Soundcloud to get music of past podcast guests and more. And Yes of course I’m on Twitter! To submit to become a featured guest on the podcast or to be on the website or newsletter, use the contact page to submit your contact information and why you want to be featured. Click HERE to contact me today!